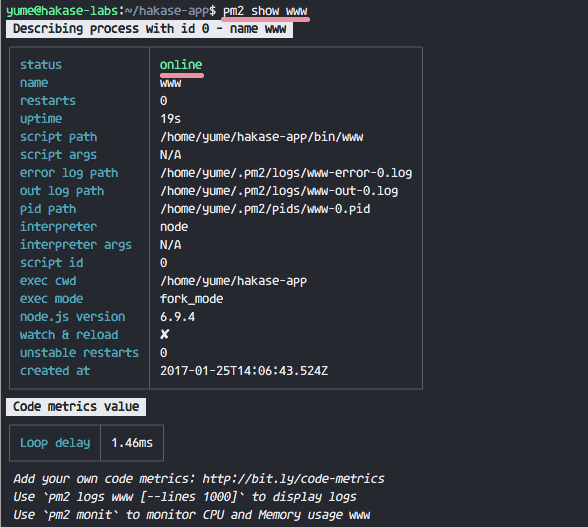 pm2 is a process manager for Node.js applications, it allows you to keep your apps alive and has a built-in load balancer. It's simple and powerful, you can always restart or reload your node application with zero downtime and it allows you to create a cluster of your node app. In this tutorial, I will show you how to install and configure pm2 for the simple 'Express' application and then configure Nginx as a reverse proxy for the node application that is running under pm2. In this tutorial, we will start our project from scratch. First, we need Nodejs installed on the server. I will use the Nodejs LTS version 6.x which can be installed from the nodesource repository. Install the package 'python-software-properties' from the Ubuntu repository and then add the 'nodesource' Nodejs repository. Install the latest Nodejs LTS version. When the installation succeeded, check node and npm version. I will use simple web application skeleton generated with a package named 'express-generator' for this example installation. Express-generator can be installed with the npm command. We will run the application as a normal user, not a root or super user. So we need to create a new user first. 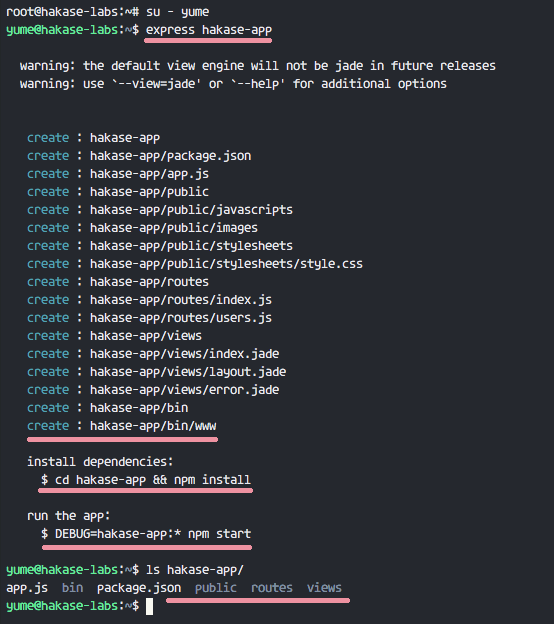 The command will create new project directory 'hakase-app'. Go to the project directory and install all dependencies needed by the app. The simple web application skeleton is running on port 3000, under user 'yume'. 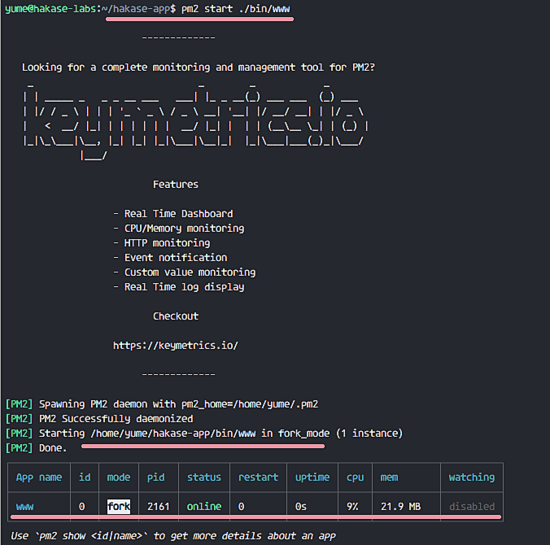 Now we can use pm2 for our web application. 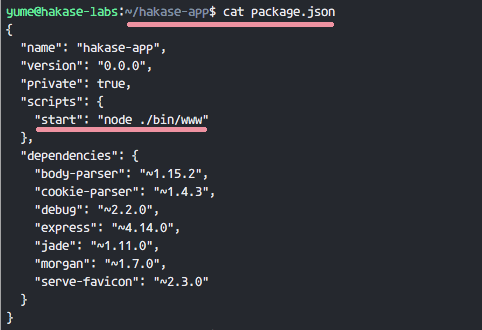 There you can find a file named 'package.json', display its content with the cat command. You can see the 'start' line contains a command that is used by Nodejs to start the express application. This command we will use with the pm2 process manager. Our express application is running under pm2 with name 'www', id '0'. You can get more details about the application running under pm2 with the show option 'show nodeid|name'. If you like to see the log of our application, you can use the logs option. It's just access and error log and you can see the HTTP Status of the application. You can see that our process is running. Now, let's enable it to start at boot time. systemd: Ubuntu 16 is using systemd. You will get a message for running a command as root. Back to the root privileges with "exit" and then run that command. It will generate the systemd configuration file for application startup. When you reboot your server, the application will automatically run on startup. Next, go to the 'sites-available' directory and create a new virtual host configuration file. The node app is running with domain name 'hakase-node.co'. All traffic from nginx will be forwarded to the node app that is running on port 3000. Activate the configuration by creating a symlink in the sites-enabled directory. Test Nginx configuration and make sure there is no error. You will see the express application is running under the nginx web server. If you have logged in again to your server, check the node app process. Run the command below as 'yume' user. The Node Application is running under pm2 and Nginx as reverse proxy. You forgot to symlink the config.